J’ai deux amours . . .
"This could very well be the most anticipiated book of the year. . . . The long wait is now over and patrience will be rewarded. George Lewis’s encyclopedic knowledge, thorough research and in-depth interviews have produced an eye-opening work. . . . Overall, it is a pleasant read, scholarly but not overly academic in tone, covering a wide stylistic range--from essay to storytelling to autobiography." "[Lewis] sets a new standard for scholarly writing about the people who make Great Black Music, or any other kind.. . . . Reading Lewis’s book about the AACM makes one want to have been a part of it." 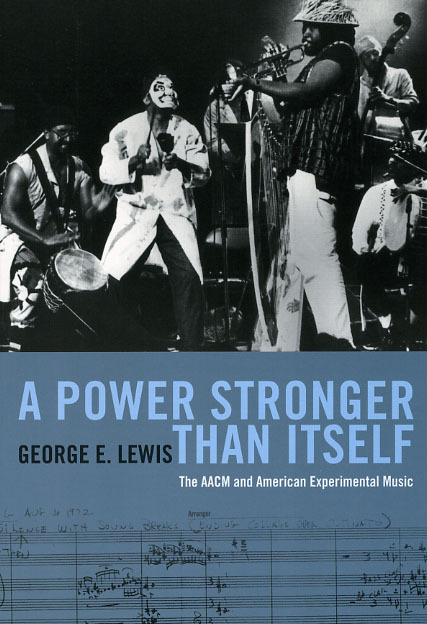 "Simply put, George E. Lewis’ new and long-awaited history of the Association for the Advancement of Creative Musicians (AACM) must be considered among the most important books ever written about creative music. A tour de force of narrative history and analysis driven by a clearly articulated point of view, it draws on a massive body of scholarship and original research that places Great Black Music in its historical, aesthetic, and social contexts. It will certainly shape the scholarly, critical, and public discussion of jazz and creative music for years to come." "Very dense but very readable, filled with fascinating stories, capsule bios and rewarding side trips. Lewis has a gift for explaining abstruse ideas without dumbing down. As a reader, I’m torn between wanting to savor it slowly and devour it fast. Two hundred pages in, I’ve got weeks worth of stuff to think about." "Lewis’ writing is lively, avoiding the trap of sounding too academic and instead creating a story that is compelling in its portrait of musicians dedicated to their art. This is a fine work on an area of jazz that deserves wider recognition and greater understanding." "An illuminating, articulate panorama of a little-examined yet highly influential organization, one whose ’graduates’ have permeated every element of modern music."